What To Expect: ZP-600 Automatic Transmission Treatment is designed to blend with the contents of all transmission fluids and allow a troubled transmission to move into its respective position more readily. For those transmissions that have lost their sense of direction, ZP-600 Automatic Transmission Treatment improves performance by reducing hesitation, revitalizing seals and reducing heat load. This super concentrate formulation for automatic transmissions dramatically reduces the frequent need for repair and/or replacement of transmissions. 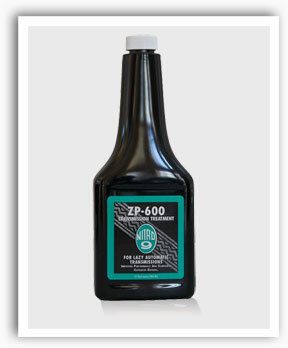 Extend the life of your transmission with ZP-600. We caution the user to realize that ZP-600 Automatic Transmission Treatment is not a mechanic. If parts are already worn beyond repair, broken or cracked, ZP-600 is not going to repair the damage. However, ZP-600 Automatic Transmission Treatment prevents damage and users continually send in letters stating that the use of ZP-600 Automatic Transmission Treatment saved the expense of hundreds of dollars for an unneeded transmission overhaul. How It Works: Gear and valve wear are virtually eliminated by the subsurface lubrication. Strain on parts is reduced allowing them to work at maximum efficiency. ZP-600 Automatic Transmission Treatment’s wet and dry dielectric anti-wear lubricants reduce friction and take over where conventional fluids break down, allowing increases in the load capacity of the system. All these components combine to reduce friction, fluid oxidation, varnish, sludge and acids. ZP-600 Automatic Transmission Treatment prevents friction heat build-up, otherwise the fluid would oxidize much faster and the hotter fluid would become very thin, increasing leakage. At 120°F or below, fluids oxidize very slowly. Above 135°F, the rate of oxidation doubles for each 18° rise. Oxidation leads to sludge formation plus harmful acids, thus creating more heat. Further, ZP-600 Automatic Transmission Treatment dissolves hydrocarbon build-up which allows an automatic transmission to function smoother and in a positive action, the way it was designed. Applications: Automatic transmissions for: automobiles, pick-ups, buses, trucks, motorcycles, dune buggies, air-cooled engines, marine and industrial engines. Directions: Basic Ratio - 1:20 - older transmissions may need an additional treatment to smooth out operation. ZP-600 Automatic Transmission Treatment is compatible with all transmission fluids. Technical: Liquid - Red Color - 325° Flash Point - Reactivity Stable - Harmful if Ingested.